The following narrative was written by Chester W. Church, co-founder of Church & Murdock Electric, Inc. Chester was born on a farm just south of Erie, PA on September 15, 1912, and was raised in the area. His partner, Alfred M. Murdock, was born on May 24, 1918 and raised in Franklin, PA.
September 14, 1912 - February 21, 2004 Born & raised in Erie, PA.. Husband of Bernice and father of Dorothy, Lucy, Mary Lou and Alfred. Co-Founder of Church & Murdock. In 1936 the Federal Government began a program called the Rural Electric Association or R.E.A. to bring electrical power to rural areas in the United States. In 1938 the R.E.A. came to Franklin Center, PA. At that time the thought of starting an electrical construction company first germinated. 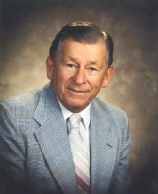 Alfred M. Murdock, my brother-in-law at the time, was twenty years old and had graduated from Franklin High School. I was 25 years old and had already had a lot of experience in the electrical field, having been employed as a locomotive wire man at the General Electric Company Plant in Erie. However, as work was slow then, I had been laid off. In May of 1938, Al and I began to wire houses and barns in Franklin Center. For almost two years, we worked in that area of the county, bidding the jobs to the farmers. In the late fall of 1939 I was called back to work at General Electric Co. Al was looking for work, so I contacted a man by the name of Leo Omelian who owned the only radio station in Erie, PA. He also owned many apartments and houses that he rented out. Al went to work for him as a maintenance man right after I began working at General Electric Co. again. 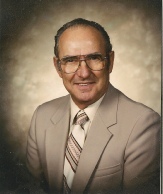 Al also put his application in at the General Electric Co. plant, and by early 1940 he was called by the company and given a job in the same area I was working on the locomotive wiring. Leo Omelian was not happy about losing Al to General Electric Co.
Al and I were working the second shift from 4:00 P.M. until 12:30 A.M. with a half hour for lunch. We did this until 1942 when the war started. Al was drafted, but since he couldn't pass the physical he enlisted. He was sent to Iran to service the locomotives that had been shipped there earlier. In May of 1943, I joined the U.S. Navy C.B. 's, the Construction Battalion. By this time I had a wife and three children. When my foreman at the General Electric plant heard that I had joined up, he called me into his office and tried to persuade me to take a deferment. Because my service to my country was important to me, I declined. The Navy sent me to Camp Perry, Virginia for training. I learned a lot in basic training and the regiment was pretty tough. As a result of a test that I took, I was chosen to go to school for six weeks to learn motors, generators, and transformers. At this time three phase four wire was just being released. After the schooling was completed, some of us were shipped to Gulf Port, Mississippi for more training. From there we were sent to Guadalcanal in the South Pacific. By this time I had a First Class Electrician rating. We were building electric lines and wiring tents. The Federal Government would send in 75 KW diesel generators, and we would use them as needed, sometimes paralleling up to four generators on one application. In the fall of 1944, I got a rupture while carrying a transformer across a slippery floor. The medical men repaired the rupture at the hospital on Guadalcanal. When I was sufficiently healed, I was given the choice of going on limited duty there in Guadalcanal or returning to the States. Choosing to go back to the mainland, I made my way to the U.S. Naval Hospital in Chelsea, MA by way of ship and train. When Germany surrendered in May of 1945, the Navy decided to discharge all limited duty personnel. I was discharged on May 16, 1945. When I returned home, I waited a couple of days and then went back to work for General Electric Co. After three months I decided to quit and go into business for myself. I returned to familiar territory in Franklin Center where the R.E.A. had begun to install more lines to extend the electric service in that area. They had been unable to do any more during the war due to shortages of copper. One of the first jobs I had in that area was to install power to the house and barn for a man named George Kellogg. When he found out that I was a G.I., he hired me on the spot, going so far as to say that he would get all of the area farmers to hire me too. It worked out very well for me. I was working very hard and had to hire another man to help me out. That man wanted to go into business with me, but I told him that I could not agree to his request because I was waiting for Al Murdock to join me. When Al got out of the service just before Christmas of 1945, I asked him if he would like to go into business with me. The business would be known as Church & Murdock Electric. He asked me for a couple of days to think it over. The General Electric Company would have taken him back had he chosen to go there. Several days later, he came back to me and said, "Yes, I am going to take a chance." It was official. 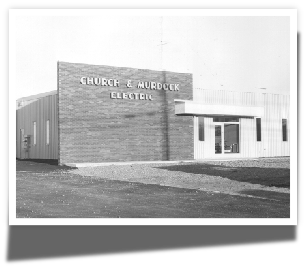 Church & Murdock Electric was born and we began operations. We had our business cards printed with the notation that both of us had been GI's, and that helped us get more work. In January of 1946, the Pennsylvania Electric Company began to push some jobs our way. They had a drive on for electric ranges and hot water tanks. All previous meters were 110 volt, and the stoves and hot water tanks required 220 volt services. Penelec gave us $55.00 per service, and we were doing as many as six and seven daily. Since we had performed so well for Penelec on the 220 volt services, they also gave us some work changing the services in the manholes to three phase four wire systems, on State Street in Erie, PA. I had learned about this type of work while I was in the service. While we were working on this project, the business agent for Local 56 visited us and told us we would be better off joining the IBEW Local 56. So in 1948 we became a union shop. We started the business in a very small and humble way. The house pictured below at 512 East 24th Street in Erie, PA had a four-car garage behind it. When I came back from the war, I rented the house. In 1948 I bought the house on a G.I. bill. We worked out of the garage until 1952 when we rented the store front pictured below at 701 Reed Street. In 1954 we built the building pictured below at 3867 Peach Street. By 1968 we were having growing pains again. We purchased a ten-acre parcel at 5709 Wattsburg Road and built a 10,000 square foot building with 3,000 square feet of offices. In October 1970, we moved into the new facility. In 1986 we added a 3,200 square foot cold storage warehouse. We experienced a horrible fire in October of 1988 and had to rebuild the entire building. By 1994 we needed more storage space and added another 3,200 square foot warehouse. During the first few years in business there were many schools being built all over the state of Pennsylvania. We did a lot of work south of Erie, PA in Kittanning, Greensburg, Brookville, Indiana, Slippery Rock and east to St. Mary's, and Clarion. Because we were doing so much work in Ridgeway, Greensburg and Johnstown, we opened branch offices in those areas. As the school work began to drop off, we closed the less productive offices, Ridgeway in the mid seventies and Greensburg in the late seventies. The Johnstown office, which opened in 1961, remains a productive and active branch, still in the same location. We purchased an additional warehouse building in the early eighties. Al Murdock and I remained active until the early eighties when we began to transfer responsibilities for the operations to our sons. We were doing about five million dollars annually in sales then. Now the Murdock boys and my son, Alfred Church are doing about twelve million a year. We started out small and wound up large. What more can I say? That is the story of Church & Murdock Electric, Inc.